MINNEAPOLIS — Chickens, turkeys, ducks and geese are flocking back to state fairs across the country after a one-year absence due to a historic bird flu outbreak that forced a ban on live poultry exhibitions in several states. The outbreak of the highly pathogenic H5N2 avian influenza was regarded as the worst livestock disease disaster to ever hit the country, costing farmers nearly 50 million birds by the time it ended in June 2015. Iowa, the country's top egg producer, and Minnesota, the No. 1 turkey producer, were by far the hardest hit states. But because the disease hasn't been detected in the U.S. since the outbreak, the fairs now are allowing bird exhibitions — including competitions for kids sponsored by 4-H and FFA. Tiana and Kayla Lenzmeier, who live near the east-central Minnesota town of North Branch, grew up in 4-H, and their 10-year-old sister, Ella, is following in their footsteps. But the two older girls missed out on the chance to show their birds last year after the Minnesota State Fair canceled its poultry exhibitions. The sisters were disappointed, but they jumped at the chance to make special projects to display at last year's fair instead. And they said what they learned during the hiatus is helping them now as they get ready for the fair, which opens Thursday. "Everybody is very glad to have poultry back," said Marla Calico, president and CEO of the Missouri-based International Association of Fairs and Expositions. Fairs had no choice last year because of the need to protect the country's food supply, Calico said. But they rose to the challenge and came up with innovative ways to let the affected kids participate anyway, she added. 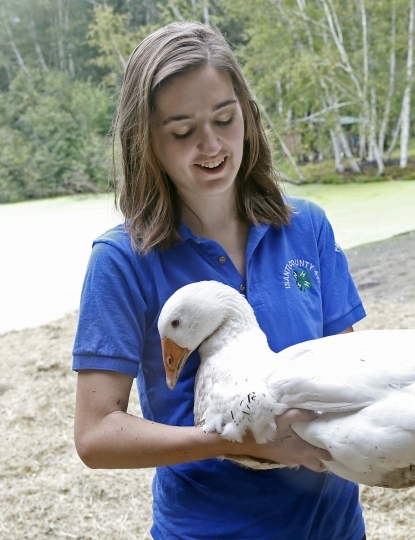 Tiana Lenzmeier, 17, will be showing market geese this year. Since she couldn't show her birds last year, she did her alternative project on the digestive system and poultry nutrition. 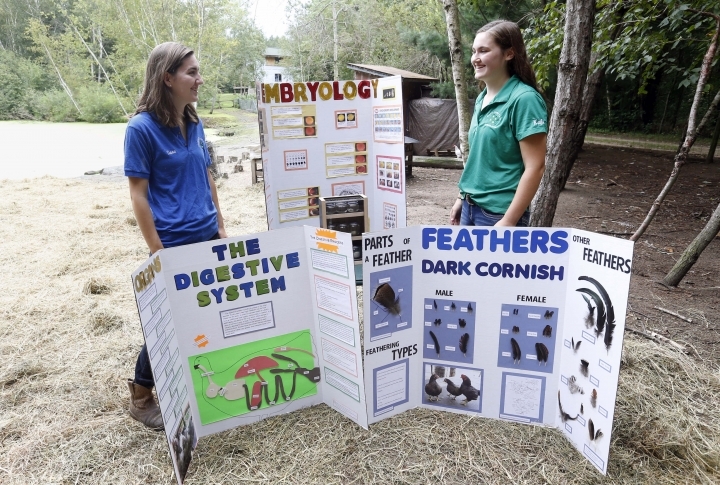 "We had the opportunity to learn about our birds in depth and I think it helps us with showmanship," she said. 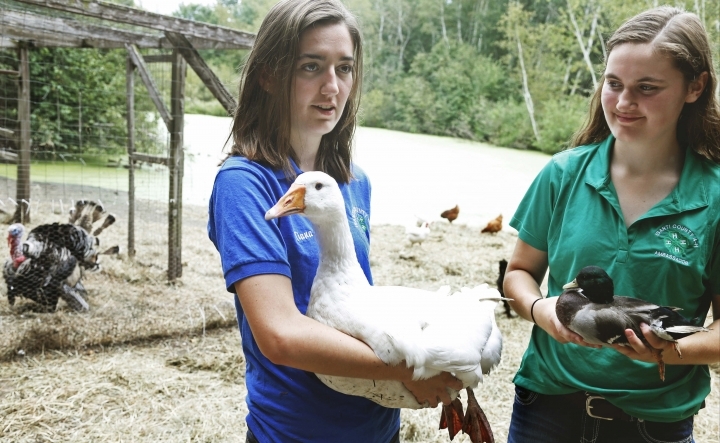 Kayla Lenzmeier, 15, is showing bantam ducks, which she said are "a difficult breed" to successfully hatch. But the pause gave her time for a project she had long wanted to tackle on duck embryology, breaking open incubating eggs every few days and preserving the embryos for a display on how they develop. She said that helped give her the knowledge she needed to get her ducks to hatch so she could show them at this year's fair. "We were handed a whole bushel of lemons and somehow figured out how to make it into lemonade," said Brad Rugg, director of fairs and animal science programs for Minnesota 4-H.
Rugg expects only a slight decrease in poultry showings this year compared with a normal 250 birds. One reason for the dip is that some kids switched last year to rabbits or other animals that weren't affected by the ban and stuck with them. Poultry returned to the Iowa State Fair earlier this month. Participation was down "just a few," said Derek Straube, superintendent of the fair's FFA Poultry Show. But enthusiasm was high, he said, "especially the kids that have the fancy birds." Breeding fancy chickens is a multi-year proposition for many families, he explained, so missing last year's state fair and county fairs cost them a year's worth of feedback as they strove to perfect their birds. Iowa 4-H members exhibited 710 birds while FFA members showed 266. City people visiting the fair were also glad to have the birds back, Straube said. "There was something missing at the fair without poultry there," he said.